By this point, it should be pretty obvious that Mitt Romney has the most hapless and mendacious surrogates EVER, but, in case you need a little more convincing, Ohio Gov. John Kasich was on hand Wednesday to provide some more evidence that the entire GOP is now officially a horseshoe crab that somehow got stuck on its back, on the beach at low tide. Let's all watch its little feet wriggle vainly in the late summer air. Speaking at a Mitt Romney-themed event on Wednesday, Kasich told the gathered masses that being married to a politician, especially a national politician, is thoroughly awful, which is probably true for every political couple other than the Clintons, who I imagine having been locked in an interminable game of Risk for the past 25 years. 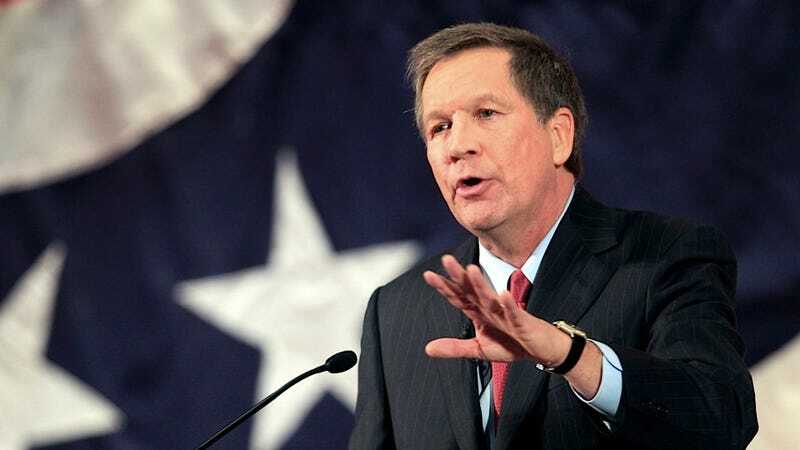 Kasich might have pointed out the fact that a political spouse has to deal with his or her lifemate being on the road for long stretches at time, or that a political spouse often has to contend with the bloodthirsty press digging for salacious stories, such as evidence of extramarital affairs. There's also this: a person who marries a politician very often has to listen to the man or woman they fell in love with, went out for root beer floats with, saw Jurassic Park in the the theater with, pander to America's valley of stupids and essentially transform into a genial robot that spouts inane, crowd-pleasing drivel about freedom and opportunity. It's not easy to be a spouse of an elected official. You know, they're at home, doing the laundry and doing so many things while we're up here on the stage getting a little bit of applause, right? They don't often share in it. And it is hard for the spouse to hear the criticism and to put up with the travel schedule and to have to be at home taking care of the kids. And where is the politician? Out on the road. Though the Huffington Post doesn't include Kasich's postscript, The Columbus Dispatch notes that Kasich tacked on this little encomium about chore-conscious political spouses: "They're heroes. These spouses are heroes." Launderers of the world, heed this well: Republicans value your continued heroism, especially if you're trapped in one of their suffocating gender paradigms.